Check pretty much any list of best new restaurants or bars in Miami, and you’ll likely find a common name: Vagabond. The retro-modern space was completely overhauled for 2015, and with equal parts old-school cool and hip chic as a part of the Vagabond Hotel, the restaurant’s menu and wine list are all about one thing: Flavor, Miami style. It’s such a hit they’re also in the running for Eater’s Miami Restaurant of the Year (vote here!). Jack Colombo, a certified sommelier who also created a remarkably inventive cocktail menu at Vagabond, has been around the block when it comes to smash-hit restaurants and bars. He’s tended bar and managed at Nobu and SoHo House before landing at Vagabond, where he and chef Alex Chang put their creativity together to shake up the Miami food and drink scene. So what makes Miami different from other regions where people are wine-savvy? Their roots … and penchant for red wines in scorching heat. The retro-cool Miami-chic dining room of The Vagabond. Jack Colombo, the brains behind the impressive wine list and cocktail program at The Vagabond. Sweetbread milanesa is the other offal-happy partner of the beef heart dish. Yep, those are grasshoppers mixed into the peanuts. Pan-seared beef heart with warm egg yolk and shitake mushroom. The poolside bar at The Vagabond Hotel, where Colombo says big, bold red wines are a common order despite the heat. 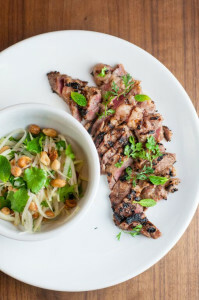 Grilled iberico diafragma, marinated‎ in condensed milk with green papaya salad. One distinguishing factor that the Vagabond has in terms of food-and-wine pairing options is Chang’s food menu, which goes all over the globe: Thailand, Mexico, Cuba, China, Morocco. There’s all sorts of oddities to please the more adventurous eaters out there, be it roasted grasshoppers mixed in with spiced peanuts, or organ-centric dishes like sweetbreads or beef heart. 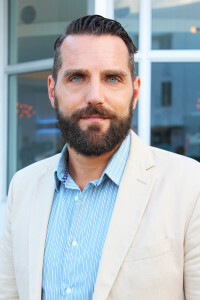 While that challenge might send some sommeliers into a sweat — which is likely in Miami on any given day — Colombo thinks that’s the perfect opportunity. So, with two Ribera del Duero wines — a ValSotillo crianza and the famed Vega Sicilia Valbuena — currently available (Jack is currently tweaking the wine list, so stay tuned…), Jack gives us his tips that would make anyone, Spaniard or not, a happy, happy eater. If you can get the Vega Sicilia and the bone-in short rib, you’re going to be in heaven. If value isn’t a concern, unleash your inner baller and order up the infamous Vega Sicilia. If you live in or near Miami, or if you’ll be ditching the cold weather this winter for a vacation there, you’re going to want to taste what Vagabond is plating and pouring. Find out more and make reservations here. Ismael Arroyo began planting vineyards in Sotillo de la Ribera when other people plucked, then people were surprised and said it was crazy what he was doing. The winery has 25 hectares of vineyards, grapes are always tended to by the same winemakers at Sotillo de la Ribera. With their dedication to the work, they tend their vineyards to pick grapes of exceptional quality. Deep cherry color, attractive, with purple rims. In the nose it is clean and complex , with rich fruity, aromatic, aromas of black fruit, dry prune and minerals. With a lot of backbone and a lingering finish.